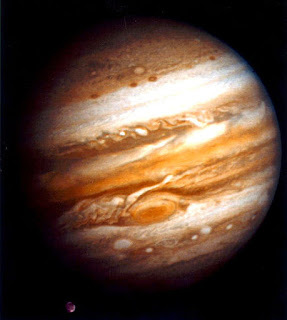 Founded at a New Moon phase (Virgo Sun 6-degrees-45-minutes Virgo Moon, Saturn in Virgo), NATO can be described as a New Moon entity to which people, events, and conditions are symbols upon a visionary screen on which the organization projects its own shadow (Rudhyar). This tendency is supported by the Solar Eclipse Saros Series in which it was founded, the 5 North (see themes on chart, lower right). Disruptive Uranus is out-of-bounds and it's a Mars Hour; transit Mercury, planet of treaties and signings, has just hit US natal Neptune, distorting facts and figures, and confusing issues. So today, as warmongering 'world leaders' heat up their rhetoric of aggression and send NATO (and other?) 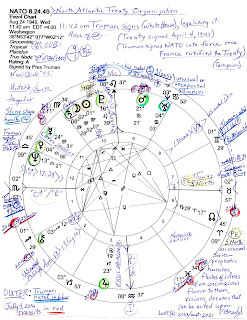 troops nearer Russia in order to provoke an ill-advised confrontation that may spiral into World War III (as planned--the power elite's set is incomplete with only I and II), I am posting the NATO natal horoscope for future reference. 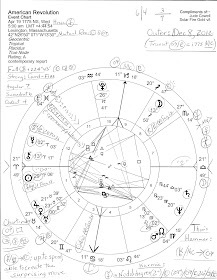 If you enlarge the chart image you can perhaps read my typically messy notes penned on and hopefully you can see Harry Truman's natal planets (in blue), plus, today's planets (in red) entered around the chart. 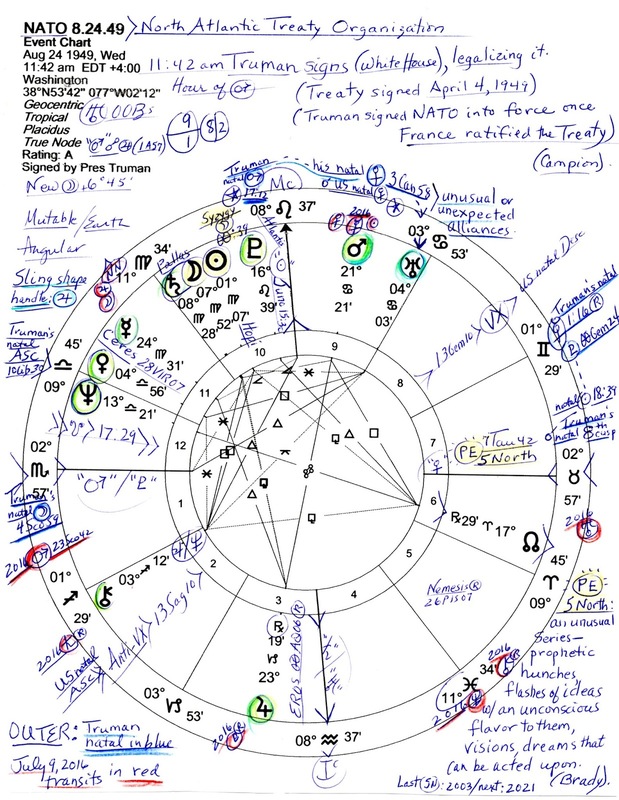 Note that when President Truman created NATO, transit Uranus, planet of revolution, had conjoined US natal Venus in Cancer and Truman's Venus for they are conjunct @3Cancer. This is penned on as: unusual or unexpected alliances. And with Scorpio rising, Mars is chart-ruler (Pluto is sub-ruler) from within the 9th house of Foreign Lands so we look to the applying aspects of Mars for hints of how things will proceed for this, another example of a new world order project. Only one major (Ptolemaic) aspect is made by warrior Mars and that's an opposition to Jupiter (1A57), marking the organization as an inflationary entity that assumes (or allows others to assume) that it is capable of greater achievements than it is. Actions tend to go too far too fast so that control isn't possible in spite of any grandstanding or bravado. Unpleasant outcomes are usually the expected result especially since Mars is in Moon-ruled Cancer. This denotes that the forces of NATO don't have a lot of perseverance or self-control and actions tend to be impulsive or rash with instincts in the lead rather than following well thought out plans. Such tendencies may have improved over the decades but that is what its natal chart tells me. "9 Aquarius": "A Flag Is Seen Turning into an Eagle"...'Keynote: The dynamic incorporation of new social values in individuals who exemplify the spiritual potential and greatest significance of these values. We have here the ACTING OUT of the vision' (Rudhyar). To this symbol Marc Edmund Jones adds a keyword: DRAMATIZATION, with a negative expression of: vindictive pride. And projecting shadows or not, both sides can rightly own up to that. Cited: An Astrological Mandala, Dane Rudhyar; The Sabian Symbols in Astrology, Dr. Marc Edmund Jones. 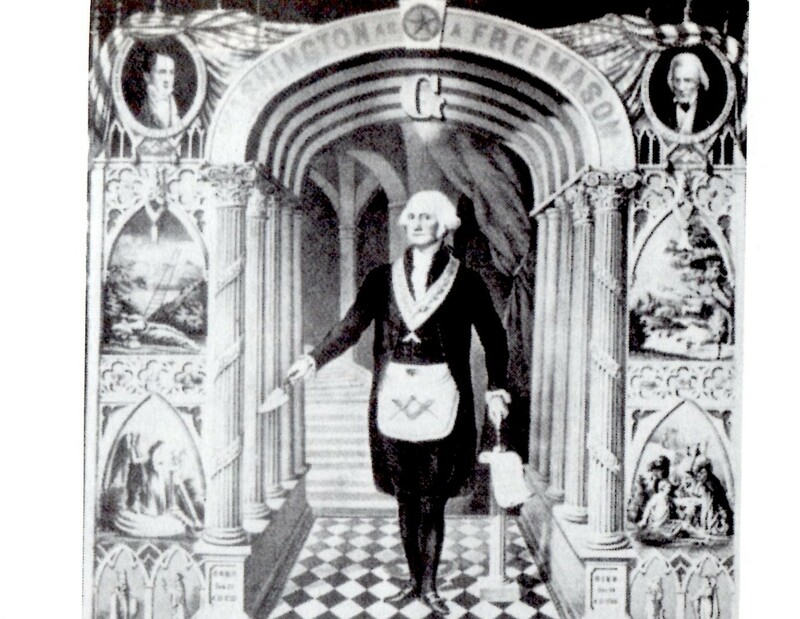 Data: Freemason Harry S. Truman May 8, 1884 4:00 pm CST Lamar, MO ('Lamar' = the Mars! ); ASC 10Libra30; Sun 18Tau39; Moon 4Sco59 gave him a ruthless desire for power and fixed prejudices (Harveys). Thx for the interesting article and for sharing both the data of NATO and Truman! Have a great 2019! Greetings from Bolivia!